The myth of an "objective media"
Support the Johnston Press strikers! 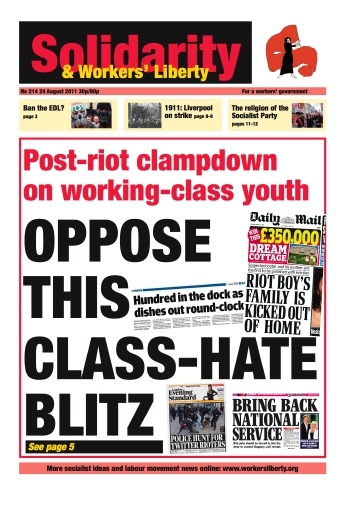 Oppose this class hate blitz! Is the future with Russia's workers? Riots: how are schools to blame? Victory to the working class of Libya! Fight union busting at Plymouth council! "Syrian people can no longer live under this regime"
Nick Davies’s first book, Dark Heart, offered a brilliant exposé of the impact of Thatcherism on the lives of working people and their communities across Britain. Whether it is resolutions at union conferences, House of Commons receptions or summer garden parties, the uncritical lauding of the Cuban government in the British labour movement stretches from Brendan Barber to Bob Crow. Barnet council Unison is taking industrial action against privatisation of council services, and on Saturdays in August has picketed an attempt to break a work-to-rule in revenues and benefits. The branch is also organising a one-day strike on Tuesday 13 September. Around 400 staff in planning and regulatory services, and revenues and benefits have for several weeks not been doing overtime and refusing to cooperate with the work being done on privatising their jobs. Cleaners working at the landmark Heron Tower near Liverpool Street in London have won a pay increase to a “living-wage” rate of £8.30 per hour, and have secured commitments from management to resolve issues of staff shortages and unfair dismissal practices. Cleaning contractor LCC also agreed to open up formal discussions with the workers’ union, the Industrial Workers of the World (IWW), with a view to establishing a recognition agreement. Leytonstone-based driver Tunde Umanah, the latest tube worker to fall victim to London Underground’s attempts to victimise union activists, has won his job back on appeal. The investigation found inconsistencies in the story of the manager who had gunned for Tunde’s job, and that memos relating to the incident were concealed from the disciplinary panel. While Tunde has been praised for his honesty, the manager has received a 12 month warning. A meeting of 600 workers involved in the long-running battle at Southampton city council has voted by 4 to 1 to reject council bosses' latest offer and continue with strike action. The offer centred on a promised £500,000 injection from the council to slightly reduce the pay cut faced by social workers, and the raising of the cuts threshold from £17,500 to £22,000, meaning that slightly fewer lower-paid workers would face the cut. The media industry’s first all-out strike in decades has seen journalists working for Johnston Press titles in South Yorkshire, including Doncaster Free Press and the Selby Times, take over a month’s worth of action. National Union of Journalists (NUJ) activists have accused the company of failing to act “humanely” towards its employees; it has so far refused to negotiate on any of the workers’ grievances and is pushing ahead with its plans to make across-the-board job cuts, including the merging of three titles into one under a single editor. The UK’s major electrical and mechanical contractors have launched an unprecedented attack on collective bargaining by attempting to unilaterally impose a new agreement on the industry. The contractors, which include industry leaders such as Balfour Beatty, wrote to workers in late July announcing their intention to impose new agreements.